With bathroom series Avento, Villeroy & Boch offers the right furnishings for every bathroom. Washbasins and bathtubs are available in several sizes, so that everything from compact bathrooms to family bathrooms can be furnished with only one series. The furniture of the series convinces by its functional design, which creates a lot of storage space. In the sanitary products, filigree and light shapes ensure an unnoticeable appearance. All in all, the series shines with modern shapes and colors - and at low prices. The washbasins, which have straight-line on the outside and rounded on the inside, are all kept in white and consist of sanitary ceramics, which can also be coated with additional CeramicPlus coating. The size is flexible and suitable for every bathroom and ranges from a width of 450 mm to a width of 1000 mm with double faucets. The depth is either 370 or 470 mm. 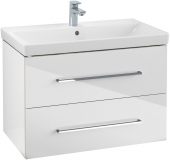 Villeroy & Boch offers vanity washbasins, washbasins, compact washbasins and hand-washbasins. The hand-washbasins are the smallest version that is perfectly suited for the guest bathroom or niche installation. In all variants, the tap holes are already holed, and some are also suitable for three-hole taps. Optional accessories include pillars, drain hoods, lockable valves, EasyAccess siphon, push-open valve and silicone overflow cover in Curacao, Bali, Peru, Sahara and Florida colors. With three different furniture variants, Avento series offers sufficient storage space: vanity units, tall units and side vanity units. The vanity units are designed in such a way that the washbasins of the series fit exactly on them and stand out somewhat, which loosens up the appearance. They are equipped with a door or two drawers and have a width of 350, 430, 530 or 580 mm, always a height of 514 mm and always a depth of 352 mm. The wall-mounted tall cabinet has a size of 350 x 1760 x 370 mm, has two doors and four glass shelves inside. The side cabinet, which is also wall-mounted, has a size of 350 x 892 x 370 mm and is therefore slightly smaller than the tall cabinet. It has two doors and two glass shelves inside. For all furniture, the fixing sets are supplied and optionally there is the furniture also with a champagne-colored decorative edge, which sets a contrast and creates an elegant look. Avento furniture has an acrylic front available in Crystal Grey, Crystal Blue, Crystal Black, Crystal White and Elm Impresso. The Avento range offers two toilet sets variants, one with a SlimSeat. Both models are DirectFlush WCs (flush rimless) and the toilet seat is with QuickRelease and SoftClosing function. The water consumption of the toilets is 3 to 6 liters, depending on which flush button is pressed. The toilet is available as wall-mounted version with horizontal outlet. On request, it can also be equipped with the CeramicPlus coating, which makes the toilet even more hygienic and prevents limescale. All toilets are made of sanitary ceramics and alpine white color. In addition to the WCs, the Avento series also offers a bidet with 370 x 530 mm measurement. Like the toilets, it is wall-hung and made of sanitary porcelain. The bidet has an overflow and the tap hole for a 1-hole fitting is already pre-holed. 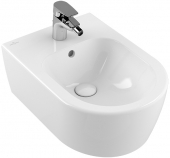 The bidet is also available with CeramicPlus coating and in alpine white color. Avento bathtubs are rectangular and available in lengths of 1600, 1700 and 1800 mm and widths of 700, 750 and 800 mm. The baths have a rounded shape inside, which conveys a lightness. They are made from acrylic, which quickly absorbs the temperature of the bath water and stays warm. The material is also smooth but not too slippery. The drain and overflow are placed in the middle for comfortable sitting, even in pairs. On request, the baths can also be equipped with a whirlpool system for more relaxation. Accessories such as LED light, tub feet and ViSound system are also available to enhance your bathtub.